Our culture believes that women are not naturally aggressive. And yet, every day evidence proves otherwise: women kill their children, their husbands, their lovers, and their lovers' mistresses. Women join their lovers in torture and killings, women are psychopaths, women are terrorists and violent criminals. In this highly provocative book, Patricia Pearson demonstrates over and over again that the idea (ideal?) of female innocence is pure myth. She argues that the two main culprits of the tendency to overlook extreme behaviour in women are feminists who have claimed victimhood for women and male society which finds it impossible to see women as powerful. 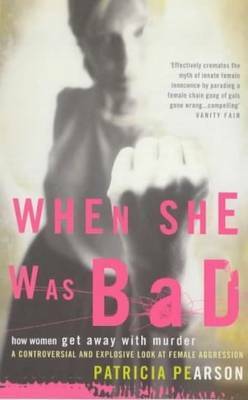 Weaving the stories of violent women - from Myra Hindley and Rose West, from a mother who smothered eight of her children, from nurses who murdered their infant charges, to husband beaters - with the findings of criminologists, anthropologists and psychiatrists, Patricia Pearson makes a compelling case for redefining the debate about female violence and power.